On Tuesday, an airliner crash-landed on a Myanmar road, killing three people and injuring eleven. The plane was packed with Christmas tourists heading home for the holiday. Among the injured were four foreigners, said Air Bagan, the airline in charge of the flight. It claims the three killed were all Myanmar citizens, which were a tour guide, an 11-year-old child, and a man riding a motorcycle down the road upon which the plane landed. 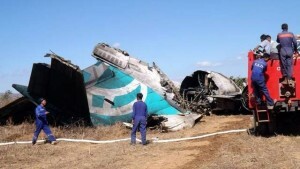 The crashed airliner was carrying 63 passengers, including 51 foreigners and six crewmen. The plane was heading from the city of Mandalay to Heho airport in Shan State, a connecting location to Inle Lake, which is a popular tourist destination. However, authorities have stated that the crashed airliner was due to the pilot mistaking the road as a runway due to bad weather. “While descending, the plane mistakenly landed…due to fog beside the runway,” said state television. The plane apparently landed upon the road, killed the motorcyclist, and then came to a stop in a nearby rice paddy field. “The rear end of the plane broke and caught fire,” said state television. Rescue teams brought the fire under control approximately 45 minutes later. Witnesses around the area said smoke filled the plane when it hit the road and continued to rise hours after the plane had been evacuated. The injured passengers were taken to a hospital within the nearby city of Taunggyi for treatment, said airport officials. While unfortunate for those who perished, the incident could have been much, much worse. Still, Air Bagan can expect lawsuits to follow within the upcoming weeks.